Plastic surfaces take a far greater beating than glass, in terms of daily use and exposure. From eyeglasses to watch faces, vehicle headlights, marine vessels and more, plastics have changed the world in terms of design and function. However, plastic surfaces are susceptible to scratches and repeated abuse. By applying Plastic Defender™, these surfaces become water repellent, more brilliant, impact, scratch and stain resistant. By protecting the surface it repels water, oils, liquids and the contaminants they carry, you need to clean less and experience a more hygienic surface and a cleaner environment where harsh chemicals are not used. The specialized formula creates a slick surface to protect against water spots, oil and dirt, making surfaces easier to clean. Sold in single-use, easy-to-apply towelettes. 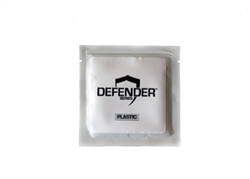 Each single Plastic Defender™ NanoPax® towelette will cover up to approximately 15 square feet. Plastic Defender™ is a consumer-grade coating and will last up to a year on surfaces that are not exposed to heavy abrasion. For high traffic areas, monthly reapplication may be necessary.